Excessive sebum secretions are usually caused by seborrhea; a skin condition caused by overactive sebaceous glands. On average, people have more than 100,000 individual hairs on the head that are rooted inside a hair follicle. Each follicle has tiny glands attached to it which releases sebum. The sebum acts as a waterbarrier and also keeps your hair and skin moisturized. Some people, however, produce too much of this good oil which leaves their hair feeling weighed down and greasy. Unfortunately, there is no instant miracle cure for seborrhea, other than a good diet, adequate exercise and some tips and recipes to help control the symptoms. To begin with, a good diet is imperative to the overall health of bodily systems and organs which includes the skin. For example, sulphur is a mineral present in every human cell with higher concentrations in the hair, skin and nails. This mineral promotes circulation and reduces inflammation. Sulphur can be found in cysteine (non essential amino acid) and methionine (essential amino acids). Essential amino acids cannot be manufactured by the body, thus we must optain it through our diets. Foods that are rich in sulphur include fish, nuts, legumes, eggs and vegetables (especially onions). One remedy that has been around a long time consists of slicing an onion and rubbing it into your scalp. It's worth a try! Important note: Sulphur is absorbed through plants that are grown in soil that has not been depleted of it's nutrients by chemical pesticides and fertilizers, which accounts for most produce not grown organically. 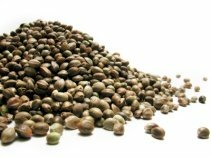 Hemp seeds (nuts) on the other hand, need no chemicals to flourish, thus are rich in nutrients including amino acids. Hemp seeds also boost your immune system which can sometimes be at the root of many skin conditions. Physical activity is equally important in maintaining good health. It contributes to a healthy weight, healthy bones, muscle strenght, joint mobility and a strong immune system. An important first step in reducing sebum secretions (other than your diet) is to change your shampoo. It probably contains SLS (sodium lauryl/laureth sulfate). This ingredient was first used to clean up grease spills on garage floors. It is also used for it's sudsing properties. That's why companies created conditioners, to offset the potency of harsh chemicals. Although it may seem natural to strip your scalp of all the oil, it's counterproductive. Sebaceous glands release oil to lube your head for protection, if you take it all off, it will produce more oil than you started out with. SLS will not only create more sebum, it will dry up your scalp temporarily, causing scales to form and possibly clogging up your pores. You should buy a mild, natural shampoo that is SLS free. If you can, buy a shampoo base and add ingredients that will benefit your hair type. Hot oil treatments are also recommended weekly. Again, it might seem to defeat the purpose, but if you use jojoba oil (which is known to inhibit excess activity in the glands) along with cederwood essential oil, you should see an improvement. All you need is 1-2 tsp' of jojoba oil and a few drops of cederwood. Warm the oil and thouroughly stir in the essential oils. Saturate your scalp and message. Cover with a plastic wrap topped with a warm towel. Keep mixture on for a few hours, then shampoo and rinse as usual. Keep in mind you may need to shampoo twice. Skip the conditioner. If time allows it, a hair rinse made of freshly squeezed lemon juice or grapefruit will tighten and contract tissues. You can do this immediately after you shampoo your hair. Rinse the lemon with cool water. This will encourage your pores to close. Apple cider vinegar will work as well. Hair, with the exception of the root, is not a living part of your body. Because of this, sebum plays an important role in protecting hair strands from root to tip, providing it with essential moisture and protection. Combing your hair with a natural bristle brush a few times a day will distribute the oil more evenly.